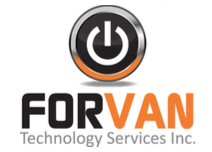 Forvan is a FULL SERVICE IT (Information Technology) company that works closely with clients to recommend and implement the BEST SOLUTIONS for their needs and budget. Information Technology (IT) is a critical part of the business process. After all, it’s the IT infrastructure that helps a business to achieve and supports its goals by balancing people, processes and technology. Adequate security is one of the most important considerations for any computer system. Information security is moving so rapidly and the media is constantly covering breaking news stories about sites being hacked, credit information stolen or virus infections causing damage that costs companies millions of dollars. Technology planning should be an ongoing process. To save the most money on technology, you should buy only what you need and use technology as a tool to accomplish your organization’s goals, yet plan ahead for change or growth. All organizations are dependant upon multiple applications and vital data. Yet every area in the country is subject to some kind of disaster – flood, hurricane, earthquake, ice storm, and landslide, to name a few. Even man-made disasters – gas explosion, civil unrest, fire, etc. – can be devastating. Have a question, comment or request. Click the button below to get in touch.